Liviko’s cooperation partner TNT offers to the clients of our online store a fast, secure and reliable courier service. You can send your purchases from door to door all over Estonia, from a single bottle of your favourite wine to large orders on pallets. Our quality courier service is for business and private clients alike. You do not need to conclude a customer contract for ordering courier service. You can place your order immediately or sign up as a user and receive a 5% discount on every purchase exceeding 20 euros – by selecting a level II customer card when you sign up. The prices of courier service depend on the weight of the parcel and are calculated automatically based on the size and destination of your order after you have selected your goods. 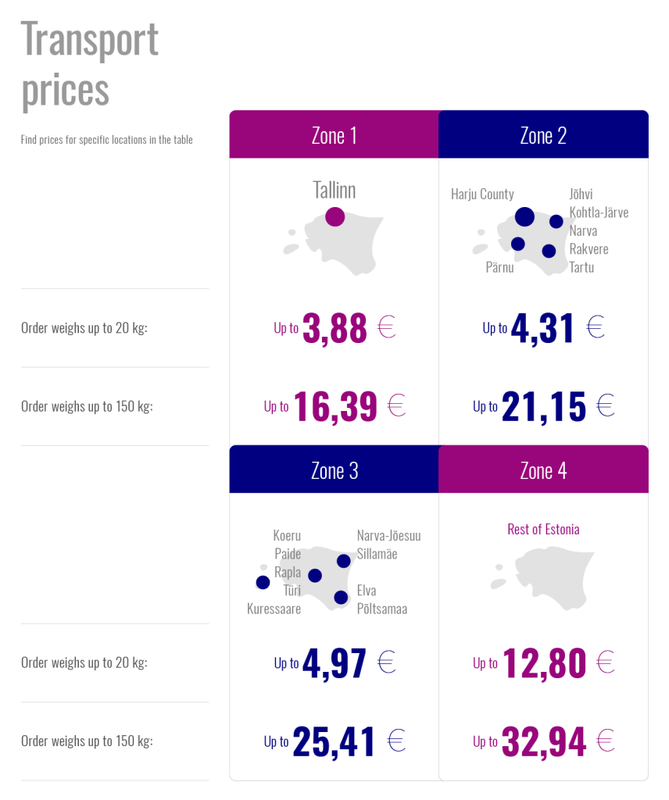 Price calculations are based on the price lists of delivery service providers. We will provide the delivery price separately on the invoice. For more information about our services, please contact our customer service at the telephone number 6837744 M-F 10:00-17:00. * Same-day order is a courier service where the order is sent to the recipient on the same day as the order was placed, between 10:00 and 17:00. The time of delivery of same-day orders is up to 4 hours from the confirmation of the order. Same-day orders may be placed until noon at the latest and this service is offered only within the borders of Tallinn. If you have any special requests, please call us on the telephone number 6837744 M-F 10:00-17:00, Sat-Sun 10:00-18:00 on the number 660 5986. * Delivery times within the rest of Estonia may be up to 3 business days from the confirmation of the order. Deliveries addressed to islands which do not have constant transport access are delivered based on the frequency of transport. Please provide any special request and specifying information at the time of placing the order in the box of additional information in the online form or at the telephone number 6837744 M-F 10:00-17:00 and on weekends 10:00-18:00 at the telephone number 660 5986. * Deliveries weighing up to 30 kg will be delivered to the door of the place of residence or location of the recipient. Deliveries exceeding 30 kg will not be transported within buildings and these will be delivered to the loading site on the ground floor of the building. * There is no obligation to telephone a recipient who is a legal person in advance and one attempt of delivery will be made. * Alcoholic beverages and tobacco products are not delivered to persons under 18. * If the delivery of the order fails due to incorrect contact information provided by the client or because the client is under 18, the sum paid by the client will be refunded, incurred transport costs will be deducted from this sum. * You can order goods via SmartPOST in amounts which can be packaged within the maximum measurements of 60 cm * 36 cm * 60 cm. If the ordered amount cannot be packaged within these measurements, you will need to use courier service or pick the order up from the store. * SmartPOST parcel terminals are located at various shopping centres all over Estonia. You can select the one that suits you best. * SmartPOST is open as long as the shopping centre where the SmartPOST of your choice is located. * When the parcel arrives, an SMS with the door code is sent to your mobile phone. To receive the parcel, enter the door code in the touch screen at the parcel terminal – the correct door will open and the parcel is yours! If you wish, you can send the door code to a reliable person who will pick the parcel up from the terminal for you. * The parcel is kept in the parcel terminal for 7 calendar days from the sending of the door code to your mobile phone.